snippets and stash: Ready, set, dye and giveaway! Ready, set, dye and giveaway! Grab your coffee and your good 'ol DMC.Some paper towels and a spoon.You won't believe how easy this is! Drip very small amounts of coffee onto floss. Let Dry.This is where I break out the hair dryer because I'm impatient.After it's dry, you can repeat the process if you want spots with deeper color. Pat yourself on the back because you just saved $$$!!! I know some of you stitchers out there pay a ridulous amount for DMC. So, I'll send 3 people 4 skeins each of DMC(2 ecru, 2 white)so that youcan do a little coffee-spot-dyeing without breaking the bank. Please leave a comment on this post only AND be sure to say that you want to be in the drawing! One of the kiddos will draw names over the weekend :) Good Luck! I would love to be in the draw! 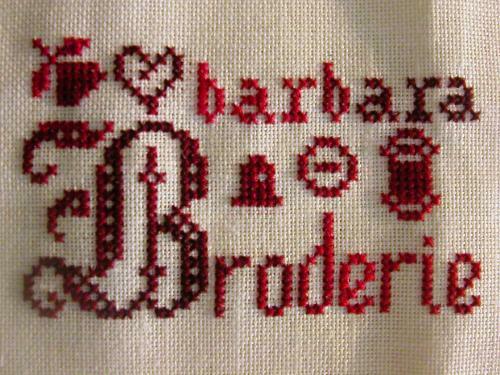 It would be fun to stitch with this. Would the DMC be colorfast? What a fantastic idea Staci! I'd love to be included in the draw. Thanks! That is too cool - I bet you could do that with other natural dyes. Thanks for the instructions!! Good luck everyone with the draw! Awesome dye job. Ran out of oatmeal GAST the other day and wasn't even liking the way it stitched up anyway. Wish I had thought of this! Oh - that looks great! I've been wanting to do a snowman that takes an ecru overdyed floss, but I couldn't afford the several skiens needed - I can't wait to try this! Thank you!!! That is a wonderful idea and it stitches up great also. Please include me in the draw Staci and thanks for your generosity. Wow, I'm going to give that a go at some stage - that's so easy but so effective. Thanks for the lesson. This is a great idea! Please enter me in the drawing. Thanks for the great photos of the steps for coffee dyeing and you get to drink the coffee afterwards! what an awesome idea! I have used coffee for fabrics, but never have I tried floss. I would love to be entered in your contest! Thanks in advance! I think even I could do that kind of dying. I'm always very messy with liquids so I usually stay away from that. Think you could use vanilla or hazel-nut and create floss for an aromatic sachet? Anyway, good luck to the contestants. I have access to inexpensive floss so I'll leave the contest to those who can benefit most. Thanks for the great tip. I am going to be trying this one. DMC is 3/$.99 at Joann's this week. I will have to go stock up on white and ecru. That is a fantastic idea and I wonder why it tookso long for someone to come up with his? We do this with fabric all the time yet the floss was forgotten. Congratulations on a fabulous idea. Very clever! I don't pay a ridiculous amount for DMC, but I would love to be entered in your drawing. Being a coffee fan, I could never imagine something like that! Maybe my Nespresso capsules could help me out :-) !! I want to be part of that giveaway (but if you think Portugal is to far away nevermind). That is a great idea for the floss! I just stitched a Halloween Pumpkin by Country Stitches that required coffee staining of the finished piece. Once you had the staining to your preference, you "baked" it in the oven at 250 degrees until it was dry (about 7 minutes). That would probably work to dry the floss as well. my dmc is dirt cheap .. good luck to everyone in the drawing! What a great idea and I am always willing to try something that is easy! Thanks so much for sharing! 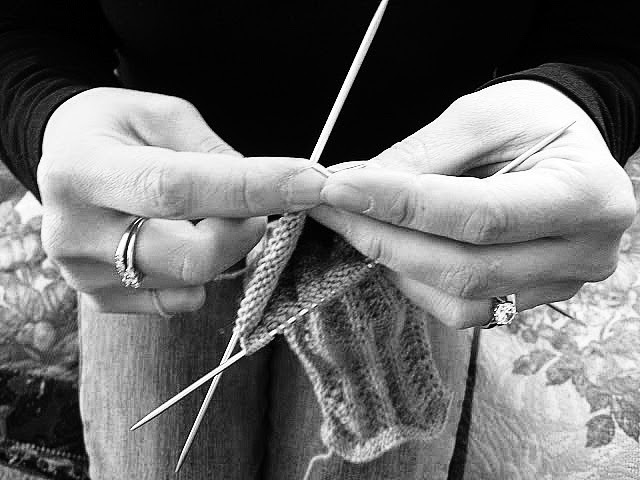 Your stitching and knitting is just fabulous! Love how you did your dyeing--came out great! Ah Staci, your tutorials are always wonderful. I am definitely going to try this as coming from New Zealand I know that sheep are not white - they are DMC ecru spot died with coffee!!! And sometimes they are just plain old dirty :-) I am going to try this for certain sure. I'd never thought about doing this with floss - brilliant!!! So that's the secret of hand dyed threads - who would have thought it could be so easy! I'd love to be in your draw please. DMC is a crazy price in Spain. Yes, include me in the drawing. What a great idea. I am sure you could use tea as well and any other natural item from home. Thanks for the idea! Wow, how simple, yet how effective! I have always been to chicken to try and dye something myself (especially with coffee, ha ha) but I may just have a go this weekend - I only have time to make coffee at the weekend ;) No need to enter me in the draw, I have a very cheap and cheerful source for DMC, the postage would cost you more than the skeins!! Loving this! Thanks for the idea! I do not need to be entered in the drawing, but thanks for sharing your threads with others. Pleae enter me in the drawing!! Wow! great idea! thank you veru much! Thanks so much Staci for the tutorial. This is awesome! I will have to give this a try!! You are so creative! Thanks fro sharing your dying process! I have so wanted to try this for ages and you have made it look just so so easy. I would love to be in your draw and as you say thread here in the UK is expensive but even so win or not I am determined to have a go now. really cute design, by the way. stitched for you is too funny! they really look great on it. style and because of the colour. are a gorgeous pumpkin colour. And the socks are so pretty too. another hobby right now anyways. I accidently found out how cool this is to do. I dropped an entire cup of Starbucks coffee in my car. Luckily I had 3 balls of dmc thread on the floor board (why they were there, I don't know). They absorbed much of the coffee. When they dried, they were the most wonderful color, ranging from light to dark! LOL! I've never dyed threads, I've only tried with fabrics. Thanks for the idea and the instructions!